A great day bag folds flat. Many airlines, especially European discount airlines, only allow one bag as cabin luggage. That’s right – no “personal item”. A good day bag is soft enough to stuff into your carry on so you don’t have to check your luggage. Avoid boxy bags made of heavy material that won’t collapse. 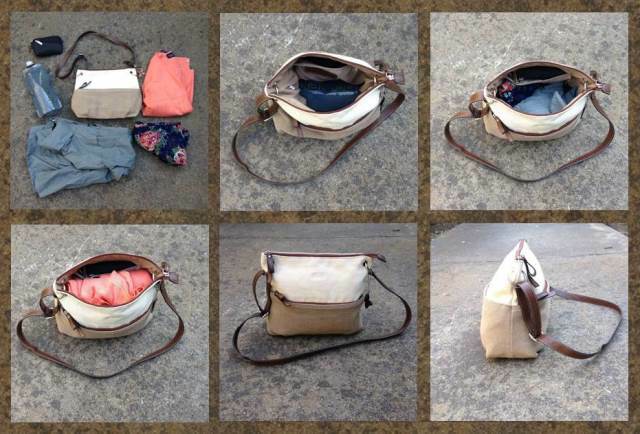 Many anti-theft bags fail in this area as they are both bulky and heavy. A great day bag has a slender profile. Many museums and art galleries are terrified that you will bump into their displays and damage them. They are also fearful of vandalism. A small bag with a low profile is almost always allowed inside, especially if held close to the body. You don’t want to bring a larger bag, including a “personal item” bag. Museum staff view these bags as security threats. They will force-check a large bag at the entrance. You’ve now lost control of your bag and anything inside of it. A smaller bag with a slim profile also has an advantage when you are in a crowded street. You won’t bump into other people and become a target of theft. You will use less energy carrying the bag around so it won’t become a painful burden by the end of the day. 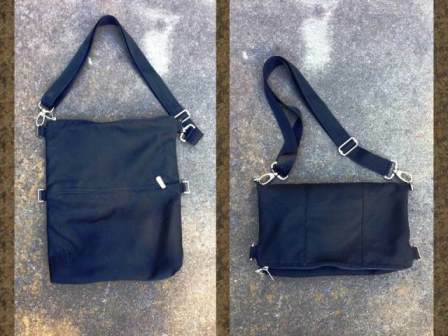 Both of these day bags are around the same size – around 10″ x 12″ (25.5 x 30.5 cm). They are small enough that they are allowed by most museums and art galleries. They are just large enough to store everything for the day’s activities. Both bags pack flat. This day bag from Timbuk2 has extra hardware that lets you expand it as needed. The bag folds over for normal trips. The bag unfolds for shopping trips or carrying a laptop. Even unfolded the bag boasts a slender profile and has never been challenged by security personnel in museums or art galleries. A great day bag is just large enough to hold your gear. While smaller is better when it comes to museums and art galleries, you also need a bag large enough to hold everything for the day. A great day bag should hold your packable rain jacket, a sweater, a scarf, a water bottle, a smart phone, and a working wallet. —It all fits! I can fit a packable rain coat, a sweater, a scarf, my collapsible water bottle, a smart phone, and a wallet into the bag. I usually put the water bottle in first, as it is fairly inflexible. The jacket and sweater go in next as they are bulky. The wallet and smart phone go into the inner pocket for extra security. The bag maintains a compact appearance which means security won’t challenge it. A great day bag has a zippered closure. Drawstring and flap closures are fashionable but they are also a pickpocket’s dream. Zippers take extra work to open, which makes them a greater deterrent for casual theft. The zipper should lock closed. If the bag does not have an anti-theft clasp then the hardware should allow the addition of a locking mechanism. It takes very little effort to make a security modification to a regular purse. 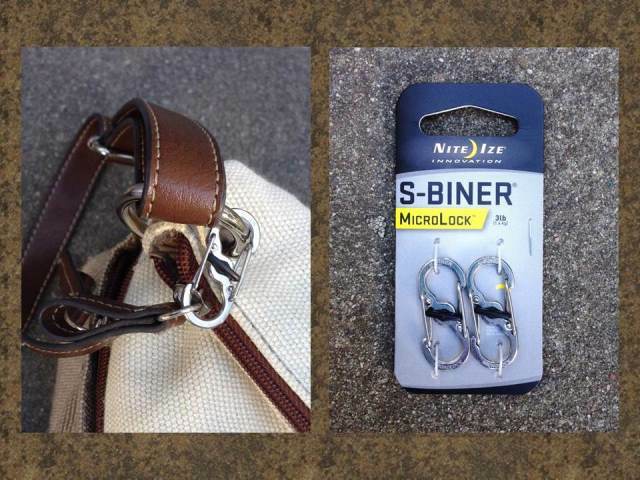 I have added a Nite-Ize locking S-Biner to my purse to minimize theft. 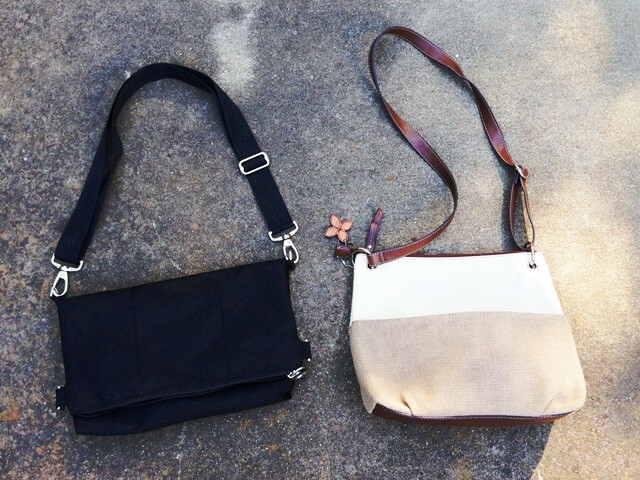 The S-Biner connects the purse zipper to the cross body strap hardware. The S-Biner is in the locked position. A great day bag has an adjustable strap. A bag rides in different places depending on the weight in the bag and bulk of any external clothing. An adjustable strap lets you adjust the position of the bag to the most comfortable and secure place. A great day bag has a cross body strap. A cross body strap lets the traveler use less energy by going hands-free. 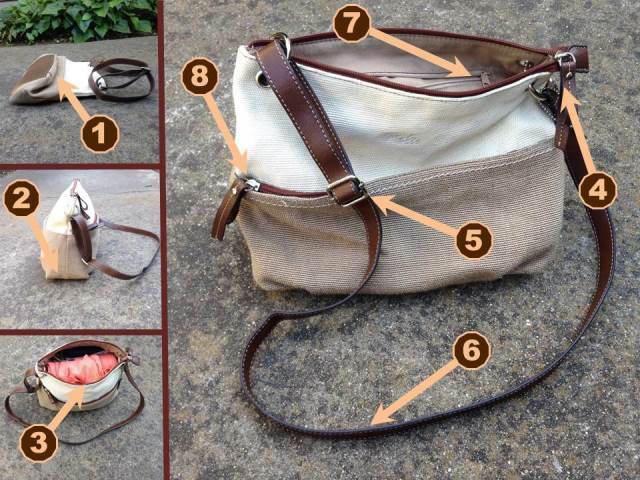 The cross body design also lets the traveler swing the bag in front of them when they are in an area with higher theft. A great day bag has an inner secure pocket. An inside pocket suspended above the main compartment provides two functions. First, the pocket provides an easily accessible storage area for frequently used items. Small items won’t get lost in the cavernous main compartment. Second, the pocket provides extra security against purse-slashers. A small pocket is a smaller target. This makes it harder to slash open to gain access to the contents. A great day bag has a secure outer pocket. During the course of the day we need easy access to metro tickets, guide books, keys, lip balm, and assorted small items. A zippered outer pocket keeps these items from falling out yet lets them be quickly available when needed. Many times I see women’s travel sites advocating a personal item as a day bag. This is usually in some misguided quest to get dual use out of the bag. Ignore this very bad advice! Personal items are too large to be useful for a regular day trip. I guarantee that museum security will force you to check any bag that is the size of a personal item. You will also be tempted to overfill a large bag and end up with aching shoulders. You’ll bump into other travelers. Please, stick to a smaller day bag! Buy a packable nylon tote if you must bring a personal item on the plane. Place your day bag inside of the tote, along with any other items for the flight. Store the tote in your day bag when you arrive at your destination. Packable totes make great shopping bags and beach bags. With a day bag / tote combination you’ll always have an appropriately sized bag. I love those Nite Ize S Biners and use them for the same purpose – has worked great all over Europe. Totally agree with you about the difference between a “personal item” and a day bag! We also use the S-binders to secure the minor compartments on our suitcases where there’s nothing particularly valuable packed. Those S-binders are really a wonder and a great price for the added security. Great advice here to help us meet a regular packing challenge. Went to the Timbuk2 to look at the day bag, but can’t find it. Do you have the name it is shown as? It is called the Stowaway. Unfortunately it is no longer offered. Timbuk2 is offering the Transit Mini-Messenger as an alternative. Personally, I think that they aren’t the same at all. I’ve looked for other fold over bags but so far haven’t found one with a zipper closure. Well wouldn’t you know it! I’ve been looking forever! What model bags are shown? The black bag is the Timbuk2 Stowaway, no longer manufactured. The Tan/Cream bag is by Relic. I bought mine at Kohls. There are a lot of similar bags out there. You’re looking for a bag that is 10″ by 12″ by 2-3″ thick. Google “relic cross body bag” and you’ll get several hits. I like a nylon bag with lots of compartments for travel .It is lightweight, durable and resists rain with spaces to keep you organized. This is a very good article. My favorite travel bag is from Eagle Creek, and fits your requirements very well – maybe a little larger. Sadly, it too is a discontinued style. But I would suggest looking on sites like Ebay, Etsy or overstock.com if you want a bag that isn’t manufactured any longer. Yes, this is the only way we can find discontinued items. The Stowaway was a very popular bag and received high marks from customers, yet Timbuk2 discontinued it. It now appears that Athleta is discontinuing their “Whatever” skort even though there are thousands of reviews saying how great it is. I’m not sure what the mindset is in this decision making process! I recently purchased the Slouch Hobo from Travelon. It’s anti-theft, but I think it meets all your requirements… it packs flat, it’s lightweight, security zipper AND it has built in anti-slash sides, and RFID blocking — one of my new serious concerns! It also comes in several colors, and it’s water resistant for rainy days, and washable when it gets dirty! I love your blog, and great travel/packing tips. Thanks! Even though we don’t put anything valuable in the outer pocket (number 8 in your picture), pickpockets don’t know it and will try to open the zipper as well. How to prevent it? Thanks. I don’t like if they open it. Thanks for your advice.